« Beanie Baby Birthday – Wallace the Bear! New Beanie Boos for 2019 – Asha and Orson! Today I came upon two new Beanie Boos that are set to be released soon. Their names are Asha and Orson, and they’re both Ostriches! 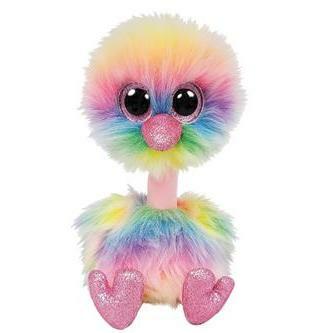 Asha is a pastel coloured rainbow Ostrich with a long pink neck. She will be available in both small and medium sizes. Orson is a brown ostrich with flecks of different shades of brown throughout his feathers and a long beige coloured neck. He will also have small and medium size options. Both ostrich Beanie Boos should be hopefully available within the next month. I just can’t wait for these two to make an appearance! What do you think of these next additions to the Beanie Boo range?